SuperFly 2 hits Los Angeles this Saturday night at The Forum, in Inglewood, California live on HBO. 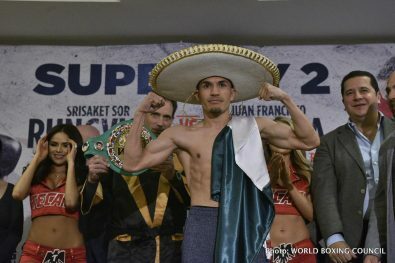 In the main event, fresh off his destruction of former pound for pound kingpin Roman Gonzalez, Srisaket Sor Rungvisai takes on the undervalued Juan Francisco Estrada. This pairing, along with a few undercard bouts should make for an entertaining night in Southern California. Several years ago the flyweight wars gave avid followers of the sweet science a taste of the good old days. Back when any given group of fighters in the same division, fought each other in round-robin unofficial tourneys. Beyond BeIn Sports, most of these matchups could and still can be found on YouTube. Thankfully, HBO is in the flyweight business and seem poised to create a more organic way of producing ticket sellers through buying good fights, instead of largely star building. This theme is the only hope for HBO to improve their non-PPV content which has seen a sharp drop in quality since 2016. Srisaket Sor Rungvisai made a splash on to the American scene last spring, engaging in a spirited scrap with Roman Gonzalez. Although a fight of the year candidate, Rungvisai got the nod in a bout most saw Chocolatito winning. No matter how you scored their first meeting, Rungvisai cleared up any question by brutality stopping the former pound for pound #1 guy. Rungvisai started out studying Muay Thai, deciding to choose boxing for monetary reasons. His career record after 5 fights was 1-3-1, once matched properly Srisaket strung together 26 straight victories. His only defeat came against Carlos Cuadras, a very solid boxer who fights on the undercard of SuperFly 2. Rungvisai brings a go-for-broke mentality that will definitely give any opponent in the super flyweight division hell. 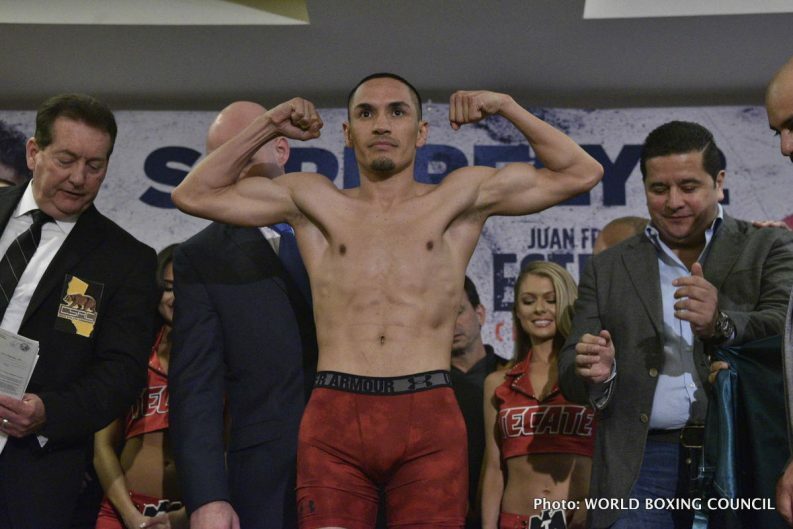 Juan Francisco Estrada earned his chops as a contestant in the flyweight wars. 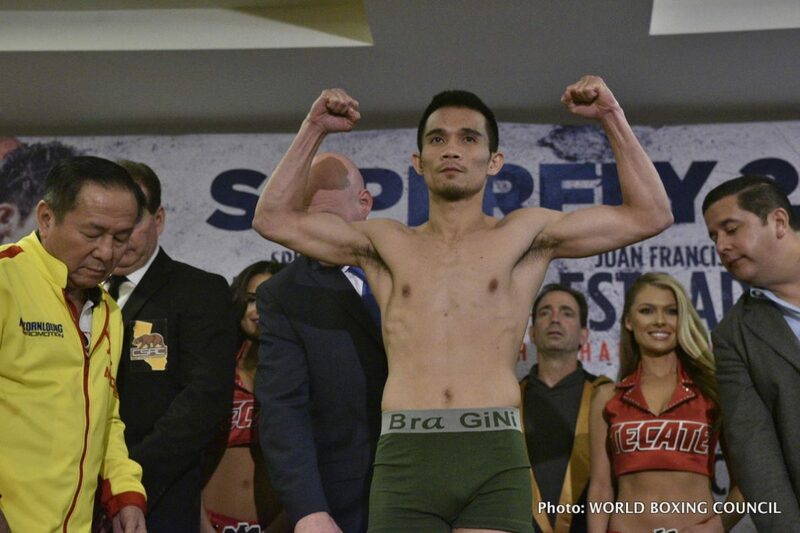 Estrada beat guys like Brian Viloria and Melin Melindo, showing great timing, skill, and power in the process. Juan’s most telling performance came in 2012, when Estrada gave Roman Gonzalez his first tough test. Estrada chased the Gonzalez rematch, moving up in weight but unfortunately inactivity and injury slowed him down. Now Estrada is has an opportunity to reignite his career by taking over this hot division. Analyzing the style-matchup for this HBO main event pits a classic boxer versus puncher on paper. Peeling back a layer allows one to see the pressure fighter, in this case Rungvisai, uses some strategy not a guy who relies on landing just one-punch. On the flip side, Estrada may strive to control distance on the outside, but also looks to inflict damage with sharp counter punches. All in all this headliner should produce some drama inside the ring and be close enough on the cards to warrant a rematch at some point. Logic tells us Rungvisai will need a few rounds to warm his engines to be effective coming forward facing a boxer-type. That said Estrada started very slow in his last fight with Cuadras, so it could actual be Estrada who gets out of the gates slow. Pigging backing that theme, Rungvisai managed to start fast and dropped Gonzalez early. Beyond the early frames, Estrada will use an accurate jab followed by power shots in effort of containing the Thailand native’s rugged style. Rungvisai’s body work is the key and probably the only way besides a knockout, he will be victorious Saturday night. Slowing down a somewhat faded, not-at-his-natural weight Estrada, will allow Rungvisai to create openings for his power punches. This fight will feature a healthy amount of two-way action, consisting of exchanges and skillful adjustments. Srisaket’s punch rate will win him plenty of rounds on the judge’s scorecards. In this hack-of-a-scribes opinion, he will need a knockdown and/or to hurt Estrada. Rungvisai’s southpaw stance will help at first, until Juan Francisco’s jab, straight right hand and hooks will be too much to handle. Unless Rungvisai drops or obviously stops Estrada, look for this fight to be a tad one-sided in the championship rounds. My Official Prediction is Juan Francisco Estrada by Majority Decision. Side Note: The other fights on the HBO Tripleheader are Donnie Nietes vs. Juan Carlos Reveco and Carlos Cuadras vs. McWilliam Arroyo. Also, an off-television bout hopefully made available by a legal stream Brian Viloria vs. Artem Dalakian. Previous boxing news: Results: Edwin Soto defeats Ray Oliveira Jr.